Owned and operated by Saybrook Point — one of New England’s premier destinations — Three Stories invites guests to unwind and enjoy the peacefulness and tranquility of a completely renovated Italianate home. Wrap around porches, private gardens, and common rooms with billiards and books offer guests places to relax and rejuvenate. 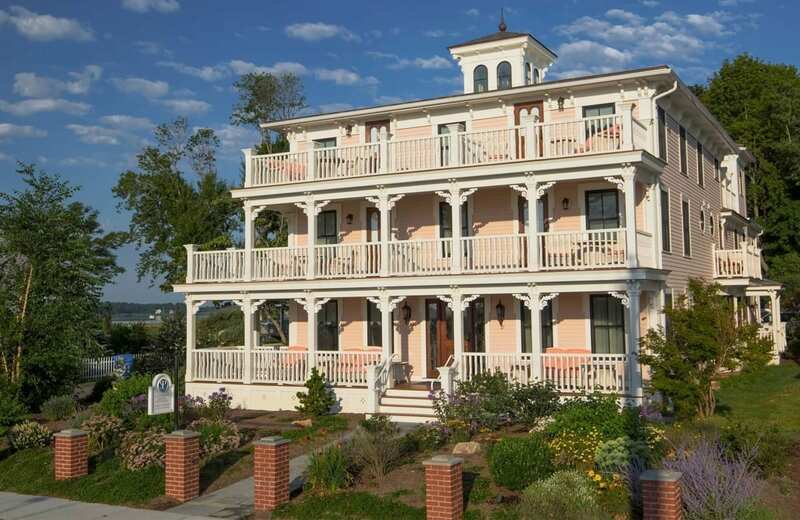 Situated among the picturesque coastal community of historic Old Saybrook, Connecticut, Three Stories features seven individually designed rooms, each with a private balcony, fireplace, European bedding, fine linens, and original artwork by local artists. And as the exclusive guesthouse of Saybrook Point, Three Stories affords travelers the luxury and comfort of casual fine dining and spa amenities at the nearby main Inn. Originally built in 1892 as a single-family home for William Vars, the landmark Three Stories guesthouse reflects the authentic New England character of a region known to value its past. Each guestroom tells a story about a famed local resident, from Katharine Hepburn’s mother who was a leading suffragette, to Anna Louise James, who had the distinction of being one of the first women and African American pharmacists in America and ran the James Pharmacy locally. As an intimate retreat or a festive gathering place, Three Stories makes the perfect setting for future stories and lasting remembrances. It’s a new home for couples, families and friends to reconnect, rejoice and create new memories and experiences. Three Stories features seven creatively designed guestrooms, including a luxurious suite and two specially designated meeting spaces, each with a private balcony, complimentary wifi, European bedding, fine linens, and original artwork by local artists. The guestrooms and suite are stylishly done, each with an interesting story about a prominent local resident such as Katherine Hepburn’s mother who was a leading suffragette. Guests also have complete access to the dining, spa and fitness club of the nearby main Inn at Saybrook Point. Additional amenities include a first floor living room with fireplace, onsite parking, and stylishly furnished rooms on all three floors with flat-screen televisions, refrigerators with snacks, as well as coffee, espresso and cappuccino machines. In addition, the third floor will feature an outdoor living room setting complete with a fire pit for those cool evening outings. Originally built in 1892, the historic Three Stories is available as a vacation rental and business retreat. The fully renovated Italianate home has private baths in each room and features three tiers of porches overlooking Long Island Sound. In addition, the bedding and housekeeping services make it convenient and accommodating as a wonderful vacation home. Three Stories is a testament to a group of individuals who made sure that the history of the Old Saybrook community was well preserved. The guesthouse’s eight rooms and public spaces invite guests to explore their historical accomplishments. Katharine lived over the causeway from Three Stories. She was a leader of the suffragette movement, and helped to found a woman’s health service now called Planned Parenthood. She raised an equally iconic daughter, whose name lives on in Old Saybrook at the Katharine Hepburn Performing Arts Center. Miss James, as she was known, was the first woman pharmacist in Connecticut. The daughter of a slave, she graduated from the Brooklyn College of Pharmacy in 1908, the only woman in her class. Her pharmacy was a wonderful local institution; it still stands, and continues to be called James Pharmacy. Anna’s niece, Ann Petry, who also worked at the shop, gained fame as an author later in life. Three Stories was his home. At one time the railroad ran by his front door, making an easy commute for Vars, who was an engineer for 43 years. During that career, he shepherded thousands of passengers on the run from Hartford to Saybrook Point. Mary’s family owned The Castle Inn in the 1960s, and Mary surrounded it with flower gardens. The Inn, still standing but a private home, once hosted the celebrated from Charlie Chaplin to Howard Hughes. Mary’s family now owns Saybrook Point Inn, and Three Stories; guests are likely to meet Mary while she’s overseeing the flowerbeds. Growing up in Old Saybrook above her mother and father’s drugstore, James Pharmacy, the legendary author Ann Petry found inspiration for her writings from the cats and customers that surrounded her environment. But it was moving to Harlem that eventually led her to write “The Street,” which became the first novel by an African American author to sell more than one million copies. She also wrote several children’s stories, eventually moved back to Old Saybrook to continue to write. His family’s roots ran deep at Saybrook Point. He is remembered as one of the last of a line of people who operated the area’s famed Ice Farms. Fitz harvested ice all winter long, stored it and sold it for refrigeration. Kids would follow his delivery truck in the hot summer months, as he was sure to toss cool chunks off the truck as he chopped off blocks to sell. Long after the age of refrigeration, Katharine Hepburn kept an icehouse, and continued to buy ice locally to keep an old New England tradition alive a little longer. An example of a classic American success story, Steffie Walters became the first woman to own the Dock and Dine restaurant and property in Old Saybrook. Together with her husband Eddie, this Austrian immigrant grew the popularity of the Dock and Dine into a landmark tradition. She later sold the restaurant to an Hungarian couple, while keeping 2.3 shoreline acres for her Sand Bar restaurant and mini-golf course. When it was time to dispose of the remaining property she turned to the community and sold it to the town in order to preserve its character for future generations. Today, through Steffie’s vision and determination, the restaurant and mini-golf course have become valuable public assets. Born in New York City in 1833, Buckridge left the navy in 1859, where he had served in the Commodore Perry Expedition to Japan and the Paraguay Expedition under Lieutenant Commander Joseph B. Hull, and enlisted in the New York Heavy Artillery in 1862. While on a woodcutting detail at Brandy Station near Rappahannock, Virginia, his right leg was injured and later amputated. After running a store for a few years, he joined the Lighthouse Service in 1877. Following six years as an assistant at Stepping Stones, Stratford Shoal and Eaton’s Neck lighthouses, he was assigned principal keeper at Lynde Point, Old Saybrook in 1883.